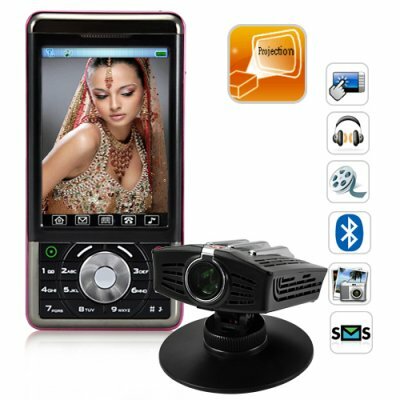 Successfully Added Mighty 3 Inch Touchscreen Cellphone with Projector to your Shopping Cart. The Mighty is a multimedia cellphone with a 3 inch touchscreen and groundbreaking cool LED projector attachment. This China Cell Phone is unlocked to work on any GSM network, has powerful digital media playback (movies, music, photos, ebook, games), and includes a projector attachment so you can share the fun with friends and colleagues. The Mighty multimedia touchscreen cellphone is designed to allow its features to be used for either business or social use. With its smooth touch screen, keypad and simple menu structure that lets you access all the features with ease, this makes for a great everyday use mobile phone that also happens to have a nice add-on projection feature for when you want to share your media collection. With the included free 2GB micro SD card you will have plenty of storage space for all your favorite vids and pics. But wait, there is still more, a bonus gift, mini USB to AV cable which allows you to view your mobile phones' display on your TV via standard a standard RCA Video connection. For sharing media, no phone can beat The Mighty! You must be thinking, sounds great, but do I really need a Projector Phone? Sure you do! With the included LED Projector attachment you can project a bright 30 inch wide display, allowing you to easily share media or data with others. The Mighty has native support for MP3, AAC and MP3 for music playback, AVI and 3GP for movie and video viewing, and GIF, JPEG, BMP image support so you can share personal and company pictures in big screen style. To add to the fun, the Mighty also has support for both Nintendo NES and SNES games with its own built in Nintendo emulator. When you are stuck on a long train ride or have nothing to do in between classes, pull out your phone and you can enjoy some classic Mario and Zelda games. The Mighty is in stock in our warehouse right now. Just click "Add to Cart" and we'll express ship one to you today! Brought to you by the leaders in cheap and unique China Mobiles, Chinavasion! NOTE: This product is compatible with GSM at the two frequencies of 900MHz, 1800MHz. It will work in the EU and other areas supporting 900MHz or 1800MHz. It will not work in the United States, Canada, Mexico. MicroSD Card Slot: Yes, 2GB Bonus TF Card included! on 2010-05-02 05:35:00 Great Innovation! Would love to see this one go Quadband! It would be THE next phone to have! on 2010-04-09 03:55:04 i luv it alot n ima get it. i saw it n like the way it looks n wat it does. Nice! This is a very good cellphone with good price!